A week after I started at Local Trust I got my first introduction to Big Local. It was a Friday in early January, the thermometer had just dived below zero and there was snow in the air as I arrived at the Barnfield Community Hub. The Hub doesn’t look like much from the outside – a grey portakabin sitting in a carpark on the edge of a Greenwich Council housing estate. But inside, there was a warm welcome, hot drinks and an amazing story of how a community – given trust, resources and time – can start to turn around an area some, in the past, might have written off. "It’s been an incredible experience – challenging my metropolitan preconceptions around the extent and nature of the obstacles encountered by many of our communities"
I’d actually got slightly lost on my way there, spending time wandering around an estate that was well kept, with smartly finished mid-rise blocks separated by well-tended open spaces and a children’s play area. The briefing said that there had been issues in the past with gang activity, but – during the daytime – there was no hint of problems other than the freezing cold. Until I came across a smoke-blackened building sitting at the heart of the estate, boarded up and – from the looks of it – occupied by a multitude of pigeons diving in and out of a damaged roof space. A building, it turned out, that was central to the Barnfield story. The Barnfield Community Centre was destroyed by fire – possibly arson - in the 1990s. Since then it had sat, abandoned, dilapidated but never knocked down at the centre of the estate. For years it had been the focus of a community campaign to replace it that, twenty years on, had not yet overcome barriers of cost, bureaucracy and – increasingly – the difficulty of making the case for new community infrastructure at a time when the funding for existing provision was tenuous at best. As I defrosted over a mug of tea in the Barnfield Hub, James Ayanda – the chair of Barnfield Big Local – told me the story of community provision on the Barnfield Estate. 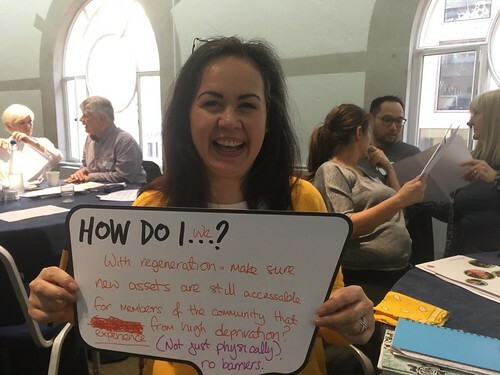 How things had been transformed by the arrival of Big Local funding 3-4 years earlier; how it had enabled the community to stop waiting for their demands to be prioritised against the myriad of other calls on resources in a deprived part of south east London. And how the through funding, trust and time they had been able deliver their own solution to the lack of accessible community space in their neighbourhood. "Barnfield is how I want all Greenwich communities to be"
The community still hoped for a new future for their former community building but, in the meantime, they had bought a space for themselves – the portakabin – where they were running their own programme of events, activities and engagement, drawing on a community willing to put collective effort into making their area a better place to be. It was the first of many visits across the country as I have sought to immerse myself in the world of Big Local. Nearly all the communities I’ve visited have faced social and economic disadvantages, some of them substantial. But what marked nearly all of them out was the way Big Local seemed to have succeeded in mobilising and motivating an incredible selection of amazing individuals to draw on local strengths, using the £1m of Big Local funding to change the terms of the debate, taking responsibility for making their communities better places to be. It’s been an incredible experience – challenging my metropolitan preconceptions around the extent and nature of the obstacles encountered by many of our communities, whilst holding out the prospect that – if we are willing to trust local people with control over resources and decision making – they are by far the best placed to turn things around.